Present paper is an attempt to discuss some of the important facets of cultural traditions and changes among the Santals ( an ethnic minority ) of Bangladesh. Santals are known as one of oldest tribal populations in Bangladesh, having their own religion (known as sonaton dharma), traditions, and customs. Their social solidarity, religion, and traditions as a distinct culture is at stake today. A large number of this ethnic minority have converted into Christianity, leaving aside their age-old traditional religion. Christianization process has brought tremendous change in their beliefs, traditions and life styles. In addition to that, influence of education, market penetration, and increasing interaction with mainstream population are also working as important forces for the Santals to undergo cultural changes. It is then important to know why they are becoming Christians. After becoming Christians, do they retain any of their traditional cultural traits and traditions? Other than conversion into Christianity, what other changes are taking place among the Santals due to external forces? These questions deserve investigation. Accordingly, in the light of answering these questions, present paper attempts to discuss the changing patterns of culture among the Santals. In the present paper I have attempted to discuss the changing pattern of culture and traditions among the Santals of Bangladesh. It is observed that the age-old traditions and culture of the Santals are undergoing changes due to the intervention of external forces, such as Christianization, education, market penetration, interaction with mainstream population. This paper discusses how these forces are working for the disintegration and transformation of the distinct archaic ethnic culture of the Santals. In Bangladesh, we find a number of tribal populations such as, Chakma, Marma, Rakhaine, Murang, Khasi, Garo, Santal, Oraon, Munda, Malpahari. More than 20 tribal groups with their distinct culture and traditions are found in Bangladesh (Dalton 1973, Ali 1998). The major bulk of the tribal populations are concentrated in areas of Chittagong Hill Tracts, Sylhet, Mymensing, Rajshahi, Dinajpur and Rangpur. Government and non-government organizations recently have undertaken different development programmes (such as education, infrastructural development, rural electrification, health facilities) in most of the tribal inhabited areas of Bangladesh (Shelly 1992). These programmes are aimed at social and economic upliftment of the ethnic minorities of Bangladesh and integrate them socially and economically with the mainstream population of Bangladesh. However, on the flip side of the coin, implications of these development strategies tend to work as forces of disintegration and cultural transition of the ethnic minorities of Bangladesh. With this brief introductory overview of the tribal populations of Bangladesh, I would now limit my discussion on the Santals only. The Santals are one of the oldest tribal populations in Bangladesh. They are largely concentrated in the districts of Rajshahi, Dinajpur and Rangpur. Rough estimate from different sources reveals that there was approximately 1,50,000 Santal population in Bangladesh in 1984 (Ali 1998:13, Sarkar 1998:147). However, updated information on the number of Santals can not be provided in the absence of tribewise breakdown of national population census report. The Santals were originally inhabitants of Chotonagpur, Santal Pargana of India. During British period they migrated to different areas including Bangladesh in search of employment, such as agricultural laborers, laborers for installing railway tracks, laborers for clearing forest and reclamation of agricultural land (Anwar 1984, Hossain and Sadeque 1984, Siddiquee 1998). Zamindars to their advantages used to employ them as laborers in the agriculture and agriculture related activities. This ethnic group was originally hunters and gatherers and used to live in hill forests of middle-eastern India. But over time due to increase of population, deforestation and scarcity of wild animals and birds, they had to move out to different areas, mainly plain land areas, for their livelihood. Santals are known as one of the oldest ethnic groups of South Asia. Anthropologists tend to identify the santals in the racial category of Proto-Australoid (Siddiquee 1984, Ali 1998). It is assumed that the ancestors of this stock of people migrated from the mainland of Australia to India some ten thousand years ago (Maloney 1974). Santals skin colors is dark, hair is black and smooth to wavy, they have broad nose with thick lips and they are of medium height (Samad 1984, Hossain and Sadeque 1984). It may be mentioned that studies on Santals of Bangladesh are very few in number. Present study cannot be claimed to be an indepth and comprehensive one, however this exploratory research may pave the way for the enthusiastic researchers and scholars to come forward for further studies on the Santals. Present study is an outcome of a short fieldwork that I conducted in Jheolmari village under Deopara union* of Rajshahi district. Secondary sources of data were also used while writing this paper. The village Jheolmari was selected purposively where sizeable number of Christian and non-Christian Santals were found. The village is located approximately 13 kilometres westward from Rajshahi centre city area. Anthropological techniques of observation and intensive interviews of the subjects were adopted for collecting data. The fieldwork for the study was extended for more than a month (from November 20 to December 30, 1999). Secondary sources were used to substantiate the primary database collected through fieldwork. It may * A number of villages constitute a Ward, and a number of wards constitute a Union. be noted that during fieldwork, emphasis was given on collecting qualitative (rather than quantitative) information in order to understand the processes of cultural change. Household census could not be done due to time constraint. Intensive interviews of some randomly selected subjects, reports of the key informants, informal discussions with the Santals and my own observations in the study area are the major sources of primary information collected for the present study. I as well made casual visits to some neighboring villages where the Santals live in order to have a better understanding of their traditions and change. In addition to that I made a casual visit to one periurban locality Tallipara, where almost all the Santals are found to be converted Christians with non-agricultural occupations. During the period of fieldwork, I made frequent visits to the study area (Jheolmari village) and interviewed both Christian and non-Christian Santals in order to comprehend why they are becoming Christians and also what other external factors are adversely affecting their cultural solidarity and traditions. Informal discussions with the Santals, author’s own observation and reports provided by the key informants were also important sources of information which I needed for understanding the pattern of cultural change among the Santals. In village Jheolmari there are 75 households of which 40 are Santals and the rest 35 are Muslims. Out of these 40 Santal households, 25 are not Christians and 15 are converted Christians. Santals are located contiguously in the same neighborhood of the village. The Santals were originally hunters and gatherers. However, when they migrated to Bangladesh, they were engaged primarily as agricultural laborers. These people are very poor as they do not generally own land for cultivation. As a result they work as laborers in agriculture and agriculture related activities. They are generally employed by the Muslim landowners who represent the dominant culture of Bangladesh. While talking to some respondents of the study area and adjacent villages, I learnt that the Muslims often exploit them by paying relatively low wages. Some of the Santals who had small amount of cultivable land before, leased them out to Muslim landowners for immediate need of cash and eventually lost their land. This happened because they could not repay the money in due time. It is interesting to note that among the Santals, both men and women work for wages in agriculture and related activities in rural areas. In the study area, I have found 39 (out of 40) Santal household heads are engaged as wage laborers in their own village and outside (neighboring villages). Only one household head is found who works as sweeper in the City Corporation office at Rajshahi city. He commutes on working days. Along with the male household heads, their adult female counter parts are also engaged as wage laborers in post-harvest activities, earth work, carrying and grinding bricks required for construction works in the nearby urban areas. I have learnt from key informants that due to scarcity of employment opportunities in village areas, a good number of Santals (mostly Christians) have migrated from Jheolmari and other villages to urban fringes of Rajshahi city in search of nonagricultural employment opportunities. Karim and Mahbub (2000) observed similar pattern in their recent study on periurban Santal neighborhoods adjacent to Rajshahi city. I learnt that Christian Mission and Catholic Bishop’s Organization for Charity and Development (CARITAS) located at the outskirts of Rajshahi city, generally helped these Santal migrants by offering material help and, sometimes by providing them with jobs. They also provided them with shelters. Their cooperating and helping attitudes motivated the non-Christian Santals to get converted into Christianity later on. The Santals are generally not literate. They however, have their own language known as Santali language. In Santal inhabited rural areas, as I observed in Jheolmari village, they speak to each other in Santali language. But when they speak to others, they speak in Bengali. Children generally learn both the languages at their early ages. But in the periurban setting of the Santal neighborhoods, picture is quite different as reported by the key informants and my observation also confirm this in the casual visit to one such area namely, Tallipara (located at the outskirts of Rajshahi city). Here, the Santal Christians who are more or less educated and economically reasonably well off, do not speak within themselves in Santali language. They speak in Bengali. Interestingly enough that third/fourth generation converted Christian children usually do not even know the Santali language. It may be mentioned that Tallipara is mostly inhabited by the Santal Christians (about 95%). Though literacy rate among the Santals is generally very low in rural areas, recently changes are apparent. Christian Missions have established schools in and around the Santal villages that the Santal children get inspiration to go to schools. I may mention that recently a school (up to primary level) has been established in Jheolmari village by the Christian Mission. This has specially motivated the children of this village and neighboring villages to go to school. Also Christian Missionaries make routine visits to villages for motivating the parents to send their children to schools where they can have free education, free books and other facilities. Samad (1984) and Ali (1998) observed similar situations in their respective studies. However, along with spreading education and advocating for education, they as well try to motivate the Santals to get converted into Christianity saying that if they become converted Christians, they will have better prosperity and socio-economic security. Santals are a patrilineal ethnic group where descent is reckoned through male lines. Patronyms are as well inherited through male lines. They are a patrilineal society where father is generally the household head. But females are also given significant importance as they also contribute economically in the household. It is observed in the study area that the females almost equally participate in income earning activities for the household. Household structure is generally joint in nature. With the diffusion of modern values, nuclear households are emerging as well in rural areas. I found 5 nuclear households (out of total 40 Santal housholds) in Jheolmari village. The Santal tribe is divided into 11 clans. They are (1) Hasda, (2) Murmu, (3) Kisku, (4) Hambrom, (5) Mardi, (6) Sauren, (7) Tudu, (8) Baski, (9) Besra, (10) Chaure, and (11) Pauria. In my study area and adjacent villages, I found these 11 clans. However, Ali (1998: 125) found one more clan, namely Bedea. These clans are totem based. The Santals believe that each clan has its own totem and there exists certain relationship between a clan and its totem. Totems are generally animals (such as Bison, sheep), birds (such as goose, pigeon), plants (such as a grass) (Ali 1998: 45). It may be mentioned that this clan-based society of Santals are exogamous. Marriage is prohibited within the same clan. Females after marriage adopt the husband’s clanic status and no longer remain in the father’s clan (see as well Hossain and Sadeque 1984:160). It may be noted that Santal Christians who are educated and well off, do not always strictly follow the rigid rule of exogamy. Instead, they prefer to choose spouse of the similar socio-economic status even if he/she is from the same clan. It is interesting that the Santals who are converted Christians, do retain their clan patronyms. I observed this pattern in the study area and adjacent villages. Major functions of the clans are to regulate marriage, inheritance, succession and affiliation (See Ali 1998). One becomes a clan member by birth or by marriage (applicable for females only). It is believed that these clans are hierarchically ordered on the basis of occupation (e.g. Kiskus were kings, Murmus were priests, Sauren were warriors, Baskies were traders). This kind of occupation related clan patronyms are somewhat like the Hindu caste system. But today, as I observed in the study area, these occupational heirarchies of status do not seem to have any impact on the Santals. The Santals today are no more confined within their own village. Their mobility and interaction with the mainstream population have tremendously increased due to expansion of market mechanism and employment opportunities outside their own villages. For employment, they often go outside their own areas, for buying necessary goods they go to different nearby market places as well as distant urban market places. Females also do the same for buying their necessary items. I found a few converted Christian Santal students (both male and female) of the neighboring villages of the study area who go to colleges located in the Rajshahi City area. All these tend to indicate that they are having greater interaction with the mainstream population and having wider networks. Religion is a very important element of culture for any group of people. Like many tribal groups, the Santals believe in various impersonal spirits and forces which control human life. They believe in a number of deities of which Bongas are very powerful and can do harm to mankind (Ali 1998: 207, Hossain and Sadeque 1984). The Santals worship the supernatural powers. They call their religion as Sonaton Dharma. The rites and rituals, belief in a number of deities, etc., tend to be quite close to Hinduism (Sarkar 1998). Dancing, music, and drinking alcohol are embedded in their important religious rites and rituals. Enjoyment and pleasure are most important charactristics of their rituals and festivals (Culshaw 1949, Hossain and Sedeque 1984). This distinct religious and cultural ethnic heritage of the Santals are undergoing rapid changes, particularly through the unending process of Christianization. This animist tribal people are generally adopting Christianity under the influence of Christian Missions (Samad 1984, Anwar 1984). This process of conversion of the Santals into Christianity started during British period and is still continuing unabated. It is observed that the Santals who are converted were more attracted by the prospect of social advancement and political protection (generally promised and/or offered by the Christian Missions) than by the promise of spiritual salvation (Anwar 1984: 366). 1. Spreading of education through Christian Missions is an important cause. In the Christian Mission run schools, Santals get free education and sometimes other fringe benefits such as, books, hostel accommodation etc. It is reported that behavior and attitude of the Missionaries toward the Santal children in these schools are very loving and convincing. In other words, it is an indirect way of motivating the students. 2. It is already said that the Santals are generally very poor. If they come across some kind of economic crisis (such as house repair, money needed for treatment) Missions often help them in kind or with cash. Also during severe winter, they distribute blankets among the poor Santals. These humanitarian activities often influence the Santals to get motivated for conversion. 3. It is reported that the Christian Missionaries make routine visits to different Santal inhabited villages and inquire about their problems and advise accordingly. The missionaries in such routine visits often profess the social and economic benefits they would usually get after being converted. repairing house, giving shelter who have migrated from other areas in search of employment. 5. Communal tension (often riots) between Hindus and Muslims, particularly during 1940’s, was also a cause for some of the Santals to become Christians during that period in Bangladesh. The religion and rituals of the Santals are close to that of the Hindus. As a result before and after Partition of India in 1947 whenever communal tension and riot took place, they felt insecured and were vulnerable for being considered as a part of the Hindu community by the Muslims. In order to get rid of this insecurity, some of them preferred to get converted into Christianity and become safe and secured. I learnt this while talking to some long ago converted Christians in the study area. 6. It is interesting to note that the Santals are not becoming converted Muslims though they are surrounded by the Muslim majority culture. One of the important reasons for this is that, no Islamization programmes are found to be in operation among the Santals. Mosques do not perform such duties and strategies among the ethnic minorities as done by the Christian Missions. As reported by the key informants and my observation confirm that the Muslim landlords often exploited the Santals. This tend to have developed negative attitude of the Santals towards the Muslims. These are some of the major causes that could be identified for Christianization among the Santals. 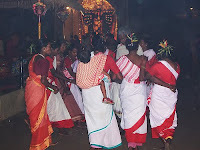 It may be noted that the converted Santals call themselves Santal Christians. However, I observed that converted Santals do retain some of the cultural traditions and traits of the non-converted Santals. They do not forgo their clan patronyms and often retain the previous names as well after becoming converted Christians. But even when they change the names, they retain the Clan patronyms. For example, in village Jheolmari a male Santal whose name was Horen Tudu, after becoming Christian changed his name to Samuel Tudu. Similarly a female Santal whose name was Mungli Hambrom, after becoming Christian changed her name to Maria Hambrom. The Christian Santals and non-Christian Santals speak within themselves in Santali language in rural areas as I observed in village Jheolmari. However in periurban Santal localities like Tallipara, I observed that the more or less educated and well to do families do not speak within themselves in Santali language. They speak in Bengali. In different yearly festivals of the Santals, Christian Santals participate mostly as observers. It may be mentioned that due to poverty, glamour of their festivals is gradually decaying. Under these circumstances they are limiting the profuseness and elaboration of their rites and rituals. Santals migrated to Bangladesh in search of employment and livelihood. But Christianization among the Santals brought tremendous change in their traditions and beliefs. Their traditional religion of sonatan dharma is at stake today. The information and discussion provided in the present paper tend to indicate that the social solidarity and homogeneity of the ethnic minority of Santals are weakening and disintegrating. In effect, culturally they are in a transitional state of situation. If this process of cultural disintegration and transformation continues under the intervention of external forces, time may come when they will have a new social and cultural formation, leaving behind their distinct cultural traditions and traits. Ali, A. Santals of Bangladesh. Mindnapur (India): Institute of Social 1998 Research and Applied Anthropology. Anwar, A. 1984 “The Question of Tribal Identity and Integration in Bangladesh,” in Qureshi (ed.) Tribal Cultures in Bangladesh. Rajshahi: Institute of Bangladesh Studies (IBS). Culshaw, W.J. Tribal Heritage. London: Lutterworth Press. Dalton, E.T. Descriptive Ethnology of Bengal. Calcutta: Council of the Asiatic 1973 Society of Bengal/Indian Studies. Hossain, K.T. and “The Santals of Rajshahi: A Study in Social and Cultural Change,” Sedeque, S.Z in Qureshi (ed.) Tribal Cultures in Bangladesh. Karim, A.H.M.Zehadul and Mahbub, S. “The Occupational Diversities of the Santals and Their Socio-2000 cultural Adaptability in Periurban Environmental Situation of Rajshahi in Bangladesh: An Anthropological Exploration”, Paper Presented in the Annual Conference of the Indian Anthropological Society, held at Santiniketan (India) during February 18-20. Maloney, C.T. Peoples of South Asia. New York: Holt Rinehart and Winston. Samad, A.G. “Notes on our Tribal Population”, in Qureshi (ed.) Tribal Cultures 1984 in Bangladesh. Sarkar, P.C. “Borendra Anchaler Adibasi Sanskriti”(in Bengali), in Borendra 1998 Ancholer Itihas. Rajshahi. Siddiquee, A.R. “Ethnicity and Intelligence: A Cross Cultural Study”, in 1984 Qureshi (ed.) Tribal Cultures in Bangladesh. Siddiquee, A.R. “Borendra Bhumir Chirayato Basinda: Nritattik Anusandhan” (in 1998 Bengali) Barendra Ancholer Itihas. Rajshahi.